The first thing you want to do when your Ge top load washer will not agitate or your Ge washer will not spin is remove the front panel to gain access to the motor and motor inverter board (the computer that sits on top of the motor). To remove the front panel use a putty knife or paint scraper and push in the two locking tabs that lock the washer front panel on to the cabinet. 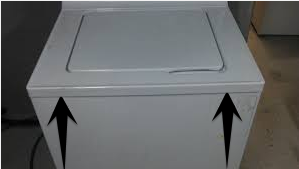 The tabs are on the right and left side of the panel, stick whichever tool you are using in the gap between the top of the washer and front panel and push the tab in until it releases one side at a time then you can remove the panel from the washer. See the image below for the tab locations. Now that the panel has been removed you can have a look at the inverter board on the motor to verify the motor is getting power. Look for the little led light on top of the inverter board, if it is lit then the motor is getting voltage. 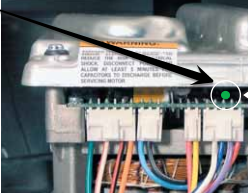 If the led light is not lit up then see the section below about replacing the Harness Fuse because the inverter board and motor is not getting power from the control and your washing machine won’t agitate or spin without power to motor. If it is lit up skip to the section Inverter Board Reset. When there is no power to the motor then the inline harness fuse has blown and needs to be replaced. The part number for the fuse is WH49X10041, you can pick them up on amazon at a reasonable price – click here. Do not bypass this fuse as you could short the washer out completely. Unplug the washer or kill power to it at the circuit breaker. The fuse is located on the right side of the washer wrapped in the wiring harness, remove the electrical wrap off the wiring harness and you will see a white wire with a red strip and heat shrink, that is the fuse. You will need to cut the fuse out of the wiring harness and install then new fuse. If the board has power you want to try to reset the board and see if that fixes the washer to do this unplug the washer for about one minute plug the unit back in and open and close the lid on the washer 5 or more times within 12 seconds of the first 30 seconds of power up. This will clear any errors the board has registered and reset the washer sometimes this is all that is needed. If this does not work for you or it did but it only ran once or so before it stopped again then see the section Inverter Board LED Flash Codes below. If you are at this point and your Ge top load washer will not agitate then there is a component failure of some sort on the washer and you will need to understand the LED flash codes the inverter board is giving. The following number of flashes will happen in .25 seconds on and .25 seconds off when there is an error. On errors 2, 4, 6, 7, and 8 if no system failures are found replace motor. If you need online appliance repair help with this or any other appliance repairs simply click the live tech help button at the bottom right of your page and you will be connected to the next available factory trained technician.